Cleaning Your House – What Apps Can Help You Out? The “ber” months are here, and this is a sure sign that Christmas is just around the corner. As early as now, you’re probably planning when you’re going to do a general home cleaning. This project can be quite challenging, especially if you’re going to do the job on your own. But nowadays, even if you don’t have anyone else to help you out, you can somewhat rely on certain phone apps to assist you as you plan your cleaning project. By using these applications, you can better organize the work that needs to be done. This app offers how-tos and general cleaning tips that you can use if you encounter common problems, like a blocked drain or stained tiles. There are comprehensive details about how to clean and organize kitchens, bathrooms, clothes, and even leather items. Recommending or sharing the provided tips is made easy because you can do this through Facebook or Twitter, or share helpful info with your contacts too. This is compatible with iPhone, iPad, and iPod Touch. Again, this is compatible with Apple devices, and it’s a great help for busy moms who certainly have a lot on their minds. The application helps you in itemizing and scheduling your chores so that you won’t feel overwhelmed by everything that you have to do. The Clean Freak has a rotating checklist that shows you when a certain task was last done. This way, you’ll know when you need to clean, say, the bathroom, kitchen or bedroom again. The app also makes it easy for you to add and delete tasks or move them or change their rotation. Good Housekeeping is one of the most well-known and trusted names in home management, and with their app, valuable tips from this reliable brand become readily available to you whenever you need them. Using your iPhones or iPads, just flick your fingers for helpful info about common stain or cleaning problems. Also, feel inspired by the home decoration ideas that the app offers. Green Shine offers great eco-friendly tips to those who want to keep their homes sparkling clean without using harsh chemicals. For instance, instead of using artificial compounds to clean your leather couch, the app will suggest that you use linseed oil and white vinegar. There are easy-to-do recipes and comprehensive instructions for cleaning. You’ll also find info about how to get rid of stains and how to deal with other more challenging clean up issues. Because you’ll be using natural substances to clean, the app is really helpful if you have kids at home or if you’re pregnant. This app, which you can get through iTunes, can aid in keeping you and your family safe from common yet dangerous cleaning chemicals. Available on iTunes, this is a great app for anyone who needs to get rid of clutter. Using this application, you can readily put used items that you no longer need on sale. So, instead of staging a garage sale, you do the selling online, which is a more convenient and time-saving approach. Take pictures of items that you want to put on sale and price them. Use Rumgr to promote these through social networking sites, like Twitter and Facebook, or you can create a preferred list of friends to whom you want to sell your things to. The Shopping Sherpa. 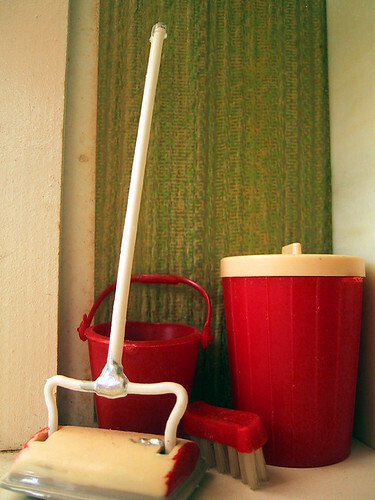 “Vintage Triang dolls house cleaning supplies”. September 8, 2008. Online image. Flickr. September 11, 2013. Claire Flint is a full-time freelancer and a stay-at-home mom who has an avid interest in home management. She blogs about her experiences and discusses issues about storage, CleanSweep Services, Inc. services, and interior decoration as well.